1. Do you know which padding to use for your home? Which padding is the best deal? Rebond - Best bang for your buck! Most commonly used in homes. Foam - Not usually a good choice, not very dense. Rubber - Too expensive! Mainly used in commercial settings. Anti-microbial If you have a moisture problem, fix it. None of the above These special features are not required, make little difference, if any, and are expensive. 7 pound Who makes a 7 pound pad? not a common density. Nylon Best for high traffic applications, most resilient, most durable. Continuous filament is the smart way to go. Carpets made with a staple fiber (short lengths of fiber) are prone to shedding and fuzzing. That means you would be vacuuming up bag after bag of carpet fibers. It is not fun, and it makes your carpet look horrible. Shedding and fuzzing can continue up to one year after installation. 7 & 8, Rule of thumb, vacuum as many times per week as you have people living in your home. Yes A beater bar is required by most carpet warranties. Even though you may or may not know what these terms mean, in most cases, none of these common carpet problems are covered by the typical manufacturer’s warranty. Read your carpet warranty to find out what is covered and for how long. Yes A great place to learn about carpet characteristics like allergies, air quality, installation procedures and more. Yes It is your responsibility to know what your carpet warranty covers. Get it and read it! They will refund my money 100%. They will refund a percentage of my money. They will replace all my carpet with another carpet of my choice. They will pay to have the carpet repaired if possible. All of the above. It pays to have your eyes and ears open and be aware of what is going on in your home at all times. 20. What do you do after the carpet installer is finished installing your carpet? The installer is to remove all scraps, haul them away, vacuum and finish job completely before you make the final payment. Carpet seams that look bad today, will look just as bad in a week or two. Don't let the installer convince you that the carpet seams will look better once the carpet has had time to settle in. Fix all problems right now, before you make final payment or withhold until you are completely satisfied. Did you learn something? I have made this quiz an informative aspect of my website because I want you to learn what you need to know about buying carpet. 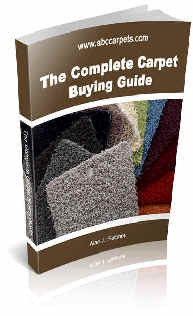 There is so much more information you need to know before you spend a dime on carpet. The important thing right now is that you do your homework before you buy carpet. If you learned something by taking this short quiz, then it should be a wake-up call for you. The questions on this quiz are the easy ones. It gets harder to make the right choices. Carpet scams are everywhere. Most people really think they know enough to buy carpet wisely, but few really do. Some people put their trust in the hands of carpet salespeople. This is a common mistake. I get emails all the time from consumers who took the advice of a salesperson only to get burned. Carpet is a major purchase! Don't take chances. If you make just one simple mistake in your carpet purchase, you stand to lose hundreds of dollars or worse. You must choose a carpet that meets your needs and lifestyle. Your home must be measured accurately, you must use the correct pad, you must have your carpet installed correctly, you must follow your carpet warranty requirements and you need to get a Good deal for the whole job. Now, I have done all your homework for you in my 120-page ebook. Order it now, download it to your computer, print it out if you like, and read it! It won't take you very long, maybe a couple of hours. But you will be well-armed with the knowledge that took me over 30 years to accumulate. It's the right thing to do. For Only $14.95 you can have peace of mind and access to powerful carpet buying information that can Save YOU Money! Make carpet shopping fun! Avoid the Carpet Scams and Buy Carpet Wisely!